There is a series of traditional Chinese New Year foods to be eaten on various specific dates during the period around Chinese New Year. Here below I will introduce them. "La-ba" means the 8th of the last month in Chinese Lunar Calendar. One year in Chinese Lunar Calendar may have either twelve months or thirteen months. This was the date when the creator of Buddhism Shakyamuni got enlightened under a Buddhi tree. Before reaching enlightenment, he fainted because of suffering from hunger. One shepherdess fed him with chyle. Shakyamuni, after eating the chyle, regained physical strength as well as wisdom. He realized that those practices he learned from some practitioners in mountains that only practices suffering of pains were not the correct way to follow. Finally he sat down under a Buddha tree and kept on sitting there for forty-nine days before he got enlightened on the date of "la-ba". In order to memorize this date of Buddha's reaching enlightenment and the shepherdess' serving chyle to Buddha, Buddhists make porridge on this date of each year. Later on, this tradition became popular among the public along with the wide spreading of Buddhism in China. According to some historical records, eating "La-ba Porridge" already became very popular in Song Dynasty of China (about 800 years ago). 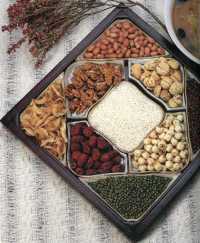 The most popular materials used in La-ba Porridge include rice, peanuts, red bean, mung beans, lotus seeds etc. There are another eight or more types of optional materials such as jujube, millet etc. Either sugar or sault can be added in the porridge. Nowadays, tinned La-ba Porridge can be bought in any Chinese food market even in western countries. However, because of the Communist Party's destroying traditional culture, not many Chinese people know about the original meaning and history of La-ba Porridge any more. 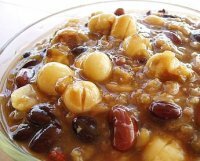 Because the date "La-ba" is towards the Chinese New Year, La-ba Porridge is regarded as one of the Chinese New Year foods now. Actually, its original meaning was not for Chinese New Year celebration, but from a Buddhism origin. The dumplings to be had today must be those left from the New Year Eve, which connotes that good fortune lasts long and always has some surplus left. In Chinese "Nian-Gao" has the same pronunciation as the word for "year" and "high". So having this food is to bless that each year's life gets higher or better. Nian-gao is normally made of sticky rice powder. 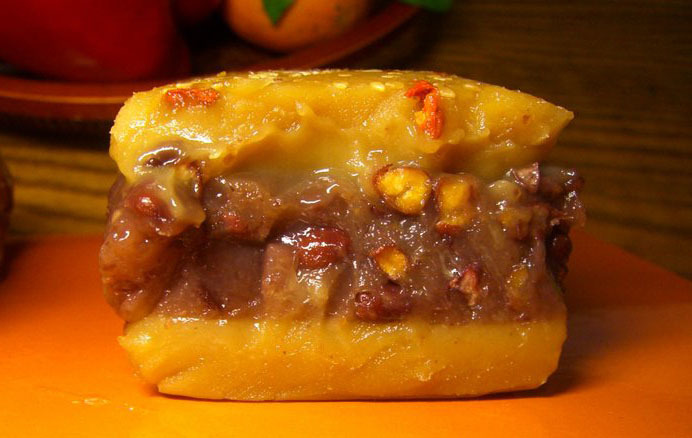 Concrete ways of making Nian-gao in different regions of China are quite different. The Reunion Dinner,like the Christmas dinner in western culture, is each year's most important dinner of the family. All family members will try to come together for this dinner from wherever they are. Chicken dish, fish dish and pork dish are must-have in the Reunion Dinner. 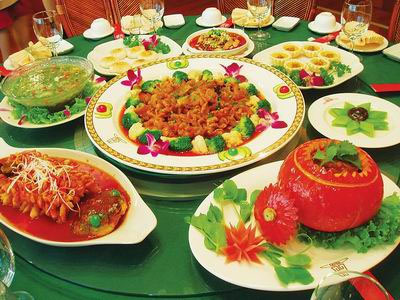 The contents of the reunion dinner may vary in different regions of China. More and more people have their reunion dinner outside. When I was in childhood, it was 1970s. Chinese people were generally quite poor at that time. A whole family had to save money for a whole year in order to have enough money to purchase materials for the Chinese New Year Eve Reunion Dinner. At that time, no ordinary family except high government officials could have chicken, fish or pork frequently. Meat was not only expensive, but also supplied by quota for each family. You just would find nowhere to buy them even if you had had money. So according to my childhood memory, the Chinese New Year Eve Reunion Dinner was just too plentiful, delicious and treasurable. My parents normally took a whole afternoon to prepare the reunion dinner and we had the dinner in early evening. It was definitely the once-a-year only opportunity to enjoy good food. In 1980s, Chinese people became richer. Meet became regular food on Chinese dining tables. The Reunion dinner is not as treasurable as that in my childhood any more. People do not like to spend that much time to cook the reunion dinner like my parents generation any more. More and more families nowadays book reunion dinner in hotels or restaurants. 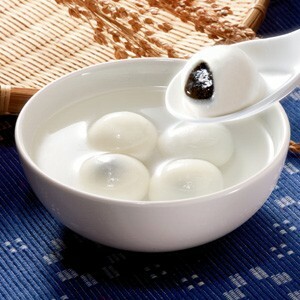 Tang-yuan is also called Yuan-xiao in some regions. It is to be had on Yuan-xiao (pronounced as "yuan-sheeao") Festival, which is the 15th day of the 1st month in Chinese lunar calendar. Its name "Tang-yuan" in Chinese has similar pronunciation as the word for "reunion", so having this food connotes the blessing of reunion. The surface of Tang-yuan is made of sticky rice. What is wrapped inside may include sweetened red bean paste, white sugar, hawthorn etc. Tang-yuan can be cooked by either boiling or deep-frying. Tang-yuan might be the last one of the Chinese New Year foods and Yuan-xiao Festival marks the ending of the whole Chinese New Year celebration. When I was in childhood, my grandma (my mother's mother) was living. She was supervising the running of the whole family and she was following these customs very faithfully. 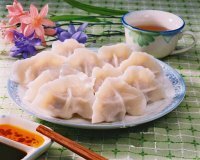 Besides Chinese New Year foods, there are several types of special foods for other special dates in a year. When each special date came, she would remind my parents to prepare the specific food for that date. After my grandma died, my parents' generation, who grew up under Chinese Communist regime's governing, do not remember these customs as well and have not followed these customs as faithfully as my grandma. Even for the above Chinese New Year foods, we have not followed the customs completely. When I become old in the future, I would like to tell my descendents to follow all these customs. Return to top of page "Chinese New Year Foods"
Return from "Chinese New Year Foods" to "Foreigners in China" Home Page.